Chris Ferriera, a new addition to our team of players, painted up all his own models, inspiring me to write up special rules for the Sons of Medusa. 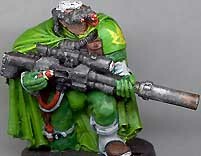 Here's his scout sniper. A typical marine. 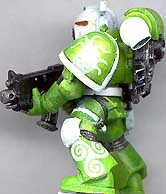 The green is well shaded with blue wash, and the white forms a good trim color. Note the swirl patterns on the armor- these are simply decals from the Wood Elf line, conveniently colored green and white. They add a great "tribal" feel to the marines. 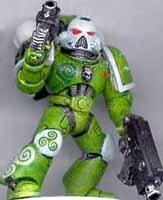 I encourage anything that can give your space marines personality, and this is a great example! A simple hand swap on the command squad sergeant allowed Chris to include this severed Medusa head (from a Lamian vampire). This odd chapter relic has been put to good use! 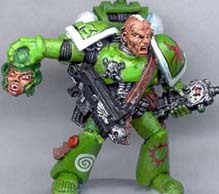 Note the dark skin tone on the Sergeant's head, nicely shaded by Chris. A nicely posed tactical marine. Chris has used white to highlight the backpack vents, kneepads, and the belts on the armor as well as the shoulder pad trim and helmet. Note more swirl decals. The snake-covered skull decal on the shoulder started as a simple skull- Chris just added the snake lines, and voila, instant chapter icon! 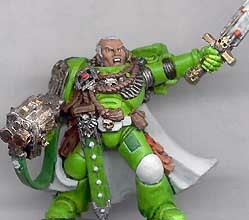 The stock Captain model from the command squad, well painted in the Sons of Medusa color scheme. Chris has chosen some interesting contrast colors that stand out nicely against the green and white, like the brown used in the braiding and purity seals.